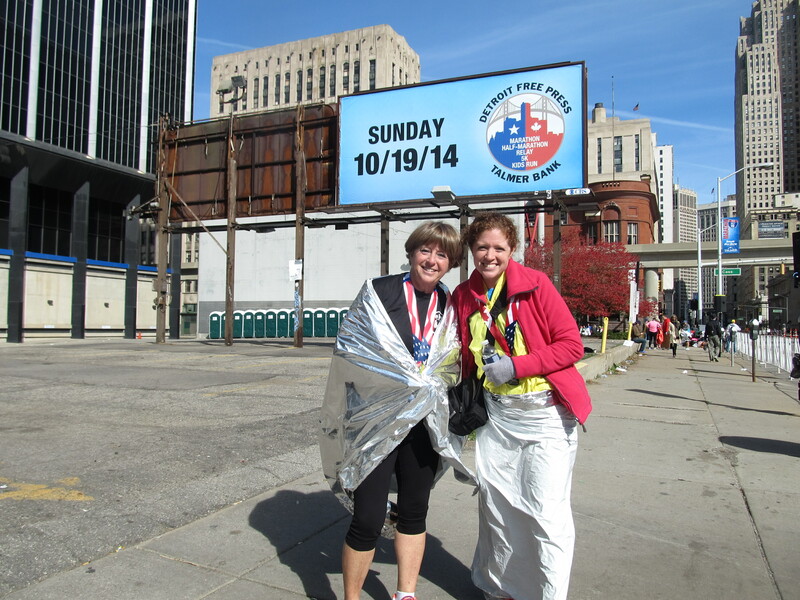 The Detroit marathon was fabulous. Our time spent in Michigan was full of family, support, congratulations, food, and fall foliage. The morning of the race, Sunday October 19th, was about 35 degrees cold. My husband was running the half-marathon, my brother his fifth marathon, my mother was walking the half-marathon and I was running my first. We corralled together in the dark after having a difficult time trying to find a place to park. We stayed at the Roberts Riverwalk hotel, a recently renovated area of Detroit along the riverwalk. My brother and I would later run this stretch of sidewalk along the river as we finished up miles 24 and 25. The hotel was about 2 miles away from the starting line and didn’t offer shuttle service. But, we had my parents who generously dropped us all off on time. Coral J was easy enough for me to find, but the boys, my brother and husband, gave me their farewell wishes and headed up to corral B and C.
Before crossing starting-line I found my cousins who had driven in early from Toronto to see us all race. My mom and dad were also there with the video camera in hand. The course led us through the west part of town with low industrial buildings to either side. Advice from a running friend in Morgantown ‘Enjoy every step.’ was running through my head. 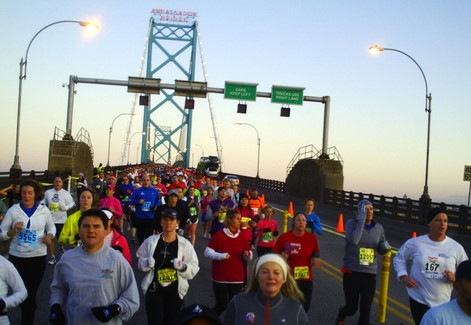 The sun was starting to rise, and as I circled around the base of the Ambassador Bridge I saw the silhouettes of runners ahead crossing it. 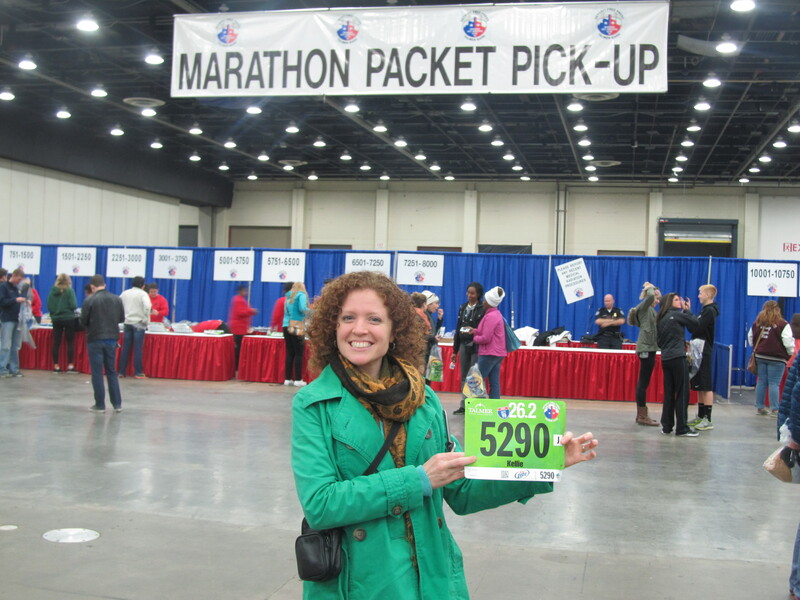 Border patrol officers were checking for bib numbers, and though I was running with my passport, I was never stopped. Lucky for me I’d trained Morgantown’s hills and the bridge wasn’t a problem for me at all. 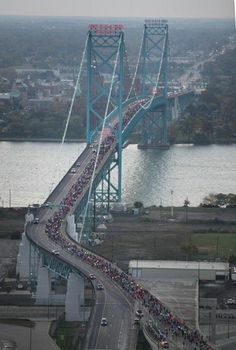 Runners nearby were stopping to catch their breath, or take pictures of Windsor and Detroit from the height. I lost my sweatshirt on the down side of the bridge. Welcome to Canada! 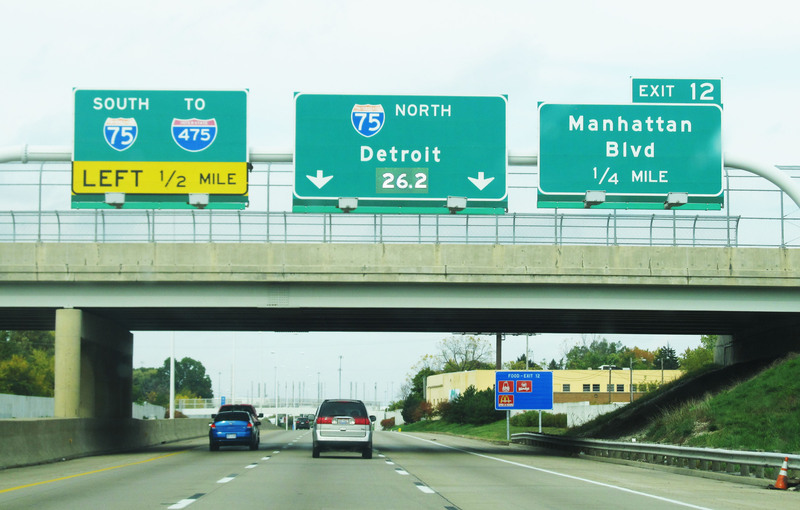 Miles in Canada were full of fans dressed in winter-wear with crazy hats and signs. I’m proud of you random adult posters, or official high-five stations were sprinkled throughout the course. 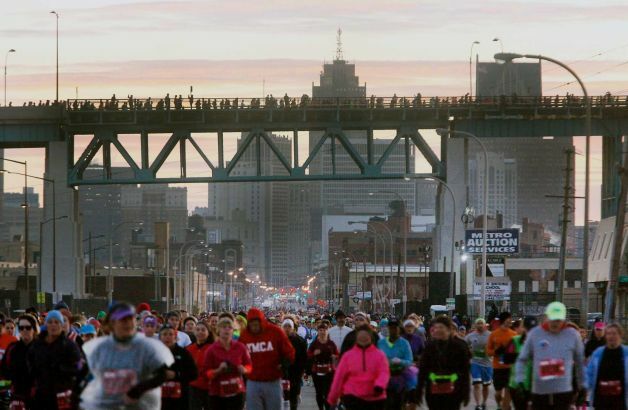 The course along the river gave view to Detroits’ skyline sparkling across the water. The sculptural park had many things to look at while I was catching up to the pace maker time of 10:40. I passed this group just before the course led us down to enter the Chunnel: our first aquatic mile. Border patrol on the Canadian side offered high-fives to the runners as we entered back into the U.S. The tunnel under the water was warm, and we continued to go downward. I was concerned about what sort of hill we’d have to climb at the end near mile 8. But, we never climbed much. Runners stripped off their outwear, and there were lots of claps and whistling sounds as we all made it under the river. Mom and dad were on the other side to take the passport baggage and gloves. It was mile 8 and I felt wonderful. The sun was warm now, and my legs that had been frozen for the first few miles of the race were thawed. I could feel my toes again. I was eating every 4 miles, and trying to hydrate at the same rate when I came across water stations. People were handing out orange slices, church groups were singing, single people held their guitars along the street and sang for us; the city was alive that morning and the encouragement to keep on moving would become more and more important as my race progressed. The 9-13 mile marker loop went west of the city again before we headed back into town for the half-marathoners to finish their race. 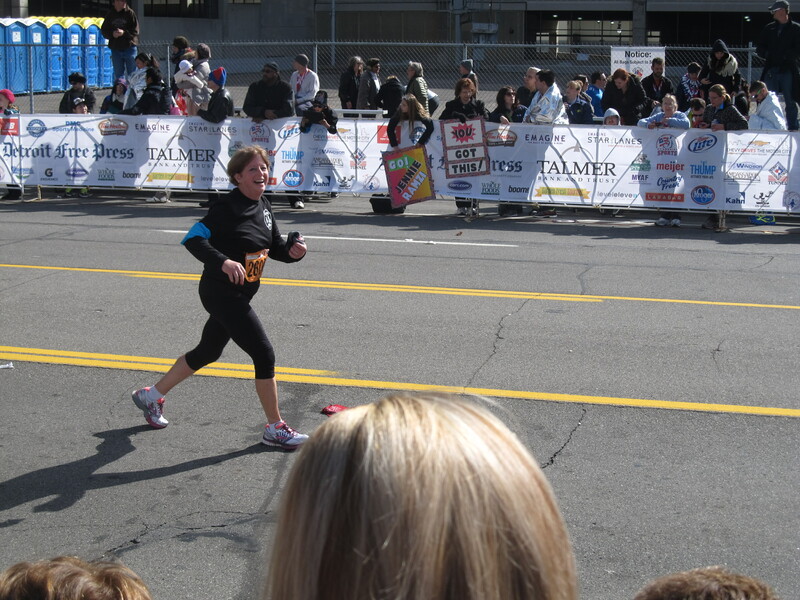 There were so many people crowded at that finish line that I didn’t see my husband until he caught me. He’d finished in a personal record of 1:36 and was covered in the plastic blanket as he ran with me for a few minutes. It was encouraging to me that he had raced so well. Just after the half-marathoners split off I realized I only had about 5 people around me. Throughout the race I’d catch up to orange-skirt girl, or tie-died pant girl. The rear view of people became most familiar. The marathoners were on their own now. 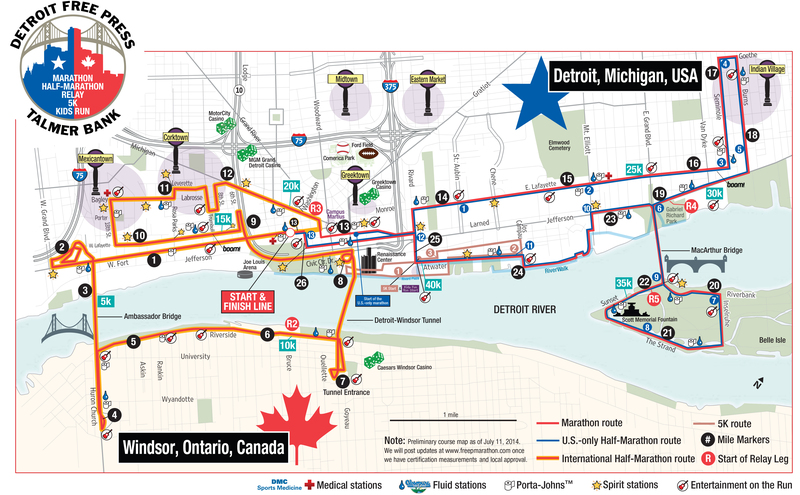 The U.S. only half marathoners would share this part of the course with us but they weren’t scheduled to begin for another hour. Mile 13 led me to cousins Mike and Andrea who kept great tabs on me the entire race. They cheered as I headed out into the next neighborhood and the second half of my race. These neighborhoods were nice and they looked new. 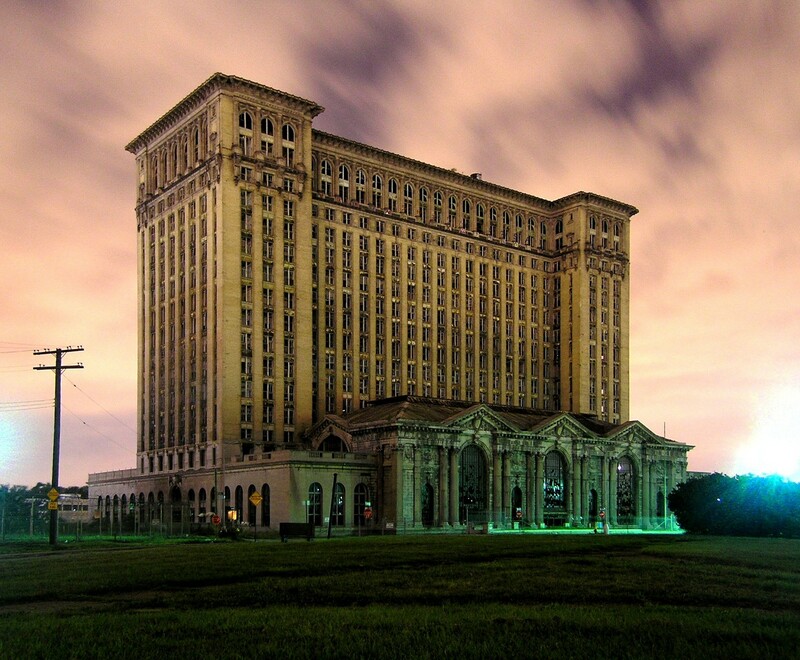 In the distance I saw ruins of a beautiful 10-story structure that I believe is the Michigan Central Depot building. 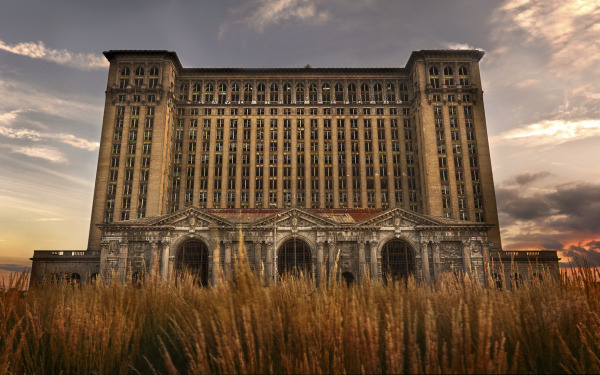 I never saw this side of Detroit on the race route anywhere else. We turned back, and headed to the Windsor Bridge to visit the conservatory on the island. I ran through great spectators, people offering beer and bourbon, ‘a wall’ which was a structure meant to signify where marathoners were in their race. The sun felt great and I headed onto the island wishing for the first time that I were in the group returning back to the main land. Miles 21-24.5 were the hardest! My legs felt like stiff logs, and I figured the faster I ran the quicker it would be over. I stopped at nearly every water station from 21miles on. There weren’t many fans on the island and the fatigue was incredibly difficult to push through. It became a race for the mind and it took everything in me to keep on going. I ran through the encouraging comments the Sues and company had given to me. It was all I had to rely on to just keep running! JFR. The mainland never looked so good, and the people along the sidelines just made the race feel better. I wasn’t alone. I needed someone to yell ‘keep on running.’ The riverwalk was beautiful and clean. It was nice not to have the skyline in the distance because it was still 2 miles away and my eyes were averted. The small incline up to mile 24 or 25 led us back to the city street we would finish on. The crowds were so busy and finally I turned the last corner and saw the place where I’d started this race: the FINISH LINE. My pace had gone from 10:40 to 10:20 and everywhere in between. Somehow I was able to keep the pace near the end when I stopped more than in the beginning. 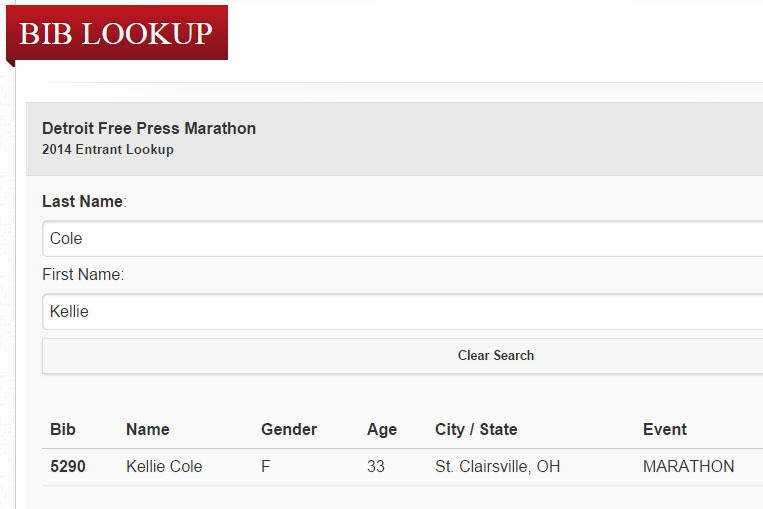 I didn’t hear everyone cheering as I crossed the finish line and received the 26.2 medal. My brother was there with a big hug and my husband with a big proud kiss as I came through the corral. Our family was all there -6 of them to cheer us all on. I sat down in the grass as we all exchanged stories and awaited my mom to cross the finish line, which she did in just under 3 hours to complete her race! I held off from a 13-hour sleep until after our family had celebrated with food and beverages. My brother recovered so quickly -I was so proud of him and the completion of his fifth marathon. As I sat in the stands after my race I commended everyone who finished at all. 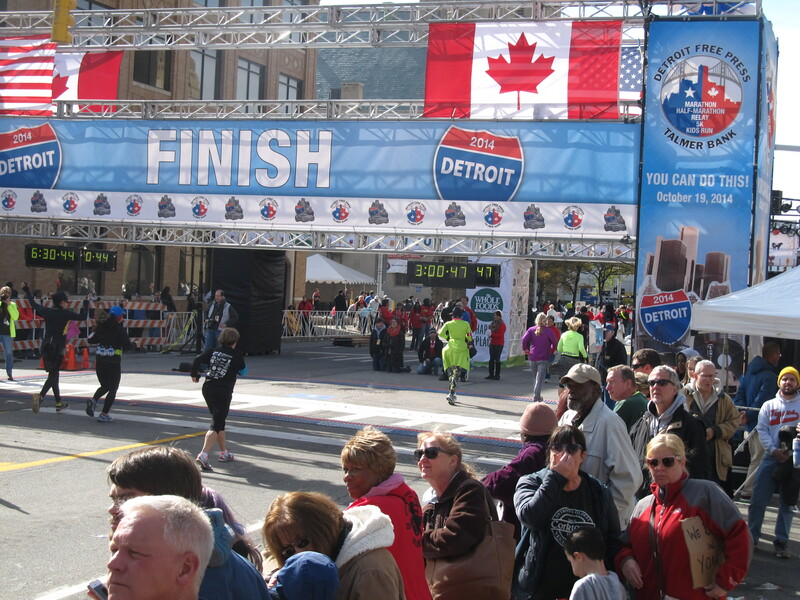 Those runners who took 6 hours to complete the race were still on their feet. The times I’d tattooed on my arms worked for me as I’d wanted to finish between 4:30 and 4:40 and did with a time of 4:33.27. This finish meant a lot for my husband and I after we’d seen each other through training the past 6 months. This signified the end to our incredible year of moving, traveling, working, and running. It was time to hibernate. well written and my favorite post yet! felt like i was there running my first marathon with you! read the whole thing out loud to little rachel. loads of smiles and coos. congrats to you on this great accomplishment, and to andy, your mom, and phil! Congratulations on finishing! Seems like a worthwhile and wonderful experience.